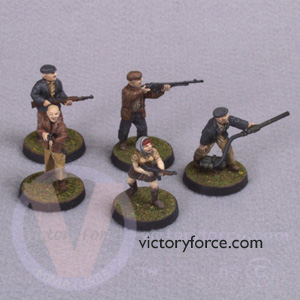 The Victory Force Resistance figures are great for WWII games where Resistance or Partisan members are needed to cause havoc for the enemy or used as guides for their allies. They are small in numbers, but their skills and daring can disrupt your opponent’s plans. Even though they are sold as WWII figures, they can easily be used in prewar pulp style games as well as modern games where their classic weapons never look out of place. Use them wherever your imagination takes you. Find them in the Victory Store in the Resistance section. This entry was posted in Spotlight and tagged 28mm, figures, full metal heroes WWII, line, miniatures, Resistance, world war II, WWII. Bookmark the permalink.